The Bird-a-Day Challenge rolls on! In the last 10 days I picked up half of my birds at my trusty local patch, Gemini Springs. White-eyed Vireo, Snowy Egret, Common Yellowthroat and Little Blue Heron were all sort of gimmes – birds I would reasonably expect to find on a normal birding day at the park. I was glad to see a Swallow-tailed Kite on the 14th along the (Gemini Springs-adjacent) Spring-to-spring Trail. They are back in town after spending the winter in South America. On April 11th, Arthur joined me on a morning bird walk. We spent the last part of the outing on the fishing pier watching birds flying out over the bayou. A wading bird flew over and I (insert sheepish grin) called it a Tricolored Heron and (insert sheepish grin) moved on. Arthur kept on it and shouted out “NIGHT HERON!” Yikes! I got back on the bird and boy, am I glad I did. At great distance we were able to put doubts on calling the bird the more common Black-crowned. Luckily the bird proceeded to FLY DIRECTLY ABOVE US right over the fishing pier! I had a horrible klutz attack while fumbling with my camera and I ended up taking zero photos of the bird. I am very glad I got good looks, though, at my BIGBY / Volusia County / 2012 / second ever in my life Yellow-crowned Night-Heron! Two planned non-birding day trips yielded a pair of nice birds I wouldn’t expect to find locally. On April 15th Arthur and I went to Universal’s Islands of Adventure theme park in Orlando. Prior to the trip, I looked at eBird to determine what birds I might expect to find there. Rock Dove is my go-to theme park bird, which I luckily have not had to use thus far. 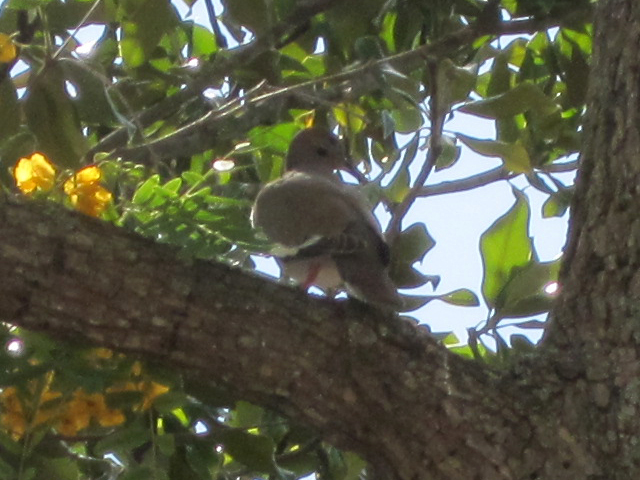 eBird divulged the strong possibility of finding a White-winged Dove at Islands of Adventure, so that was my “target bird” for the day. We saw them a couple of times during our stay; Arthur took this photo with his point-and-shoot. I always wonder about the poor saps (including me) who submit eBird checklists from the theme parks. Were they dragged there by family? Did they bring their binoculars and wait / bird while the rest of their party experienced rides or shows? I love going to Disney and our day at Islands of Adventure was a blast (Wizarding World of Harry Potter FTW!) – don’t get me wrong. But… “always be birding”, you know? So I have to pause when our path takes us close to water (any ducks? any waders?!) or if I see something flitting about in nearby trees (was that a dove? what kind?!). Anyway, I’m very grateful to my fellow eBirders for helping me to find my Bird-a-Day on April 15th. The other day trip occurred last Tuesday when Arthur and I headed to the Space Coast to bid farewell to the Space Shuttle Discovery as she was transported by Boeing hearse to Washington, D.C. After the 7AM departure we spent some time at the Visitor Center before devoting the afternoon to some birding. Usually on days like this (we’ve been to a few launches in the past year) we head to Merritt Island NWR. I’ve got county birding fever though, so I devised a plan to hit a couple of Volusia County spots instead. One of those spots was Smyrna Dunes in New Smyrna Beach. 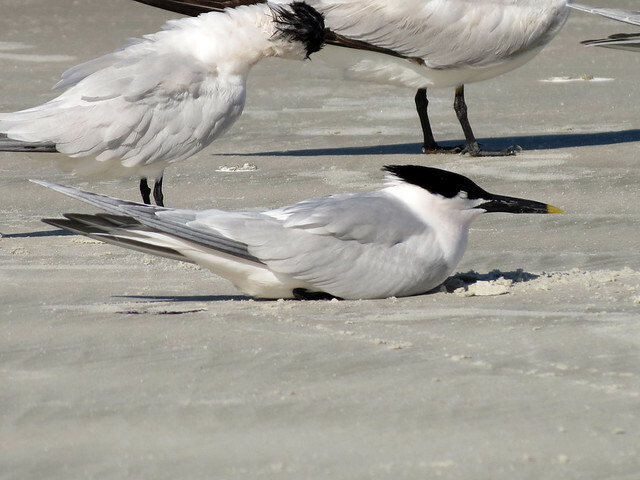 Along a stretch of beach accessible to cars, a flock of Royal Terns harbored a pair of Sandwich Terns – my Bird-a-Day for April 17. On Thursday mornings I volunteer at the Audubon Center for Birds of Prey in Maitland. Birding hotspot Mead Gardens in Winter Park is nearby, so I decided to head there last week after my volunteer shift. Reported warbler sightings enticed me, but I came up empty, warblerly speaking. I briefly spoke with a pair of birders along a part of the boardwalk, who helpfully told me about the Ovenbird, Worm-eating Warbler and American Redstart seen earlier in the day, and the Black-throated Blue they had just a moment ago. Sure. 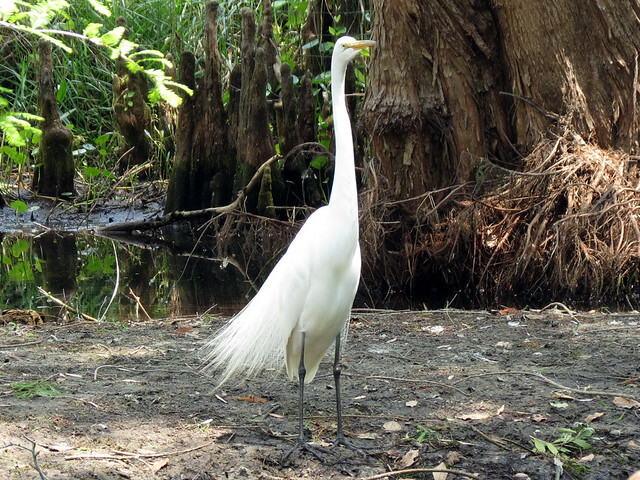 A Great Egret hanging out with a Wood Stork and a Great Blue Heron became my Bird-a-Day last week. For today I used the Great Crested Flycatcher that landed on the creance line at the Center at the start of my volunteer shift. It pained me to use a “yard bird” but it was the “best” bird I saw all day. I’ve revised my list of “easy” local birds down to just 11 species, three of which I can find in our yard on a normal day. With 18 days to go before I head to Chicago, I wonder if I have a chance? Stay tuned…! This entry was posted in Bird-a-Day Challenge, Gemini Springs. Bookmark the permalink.